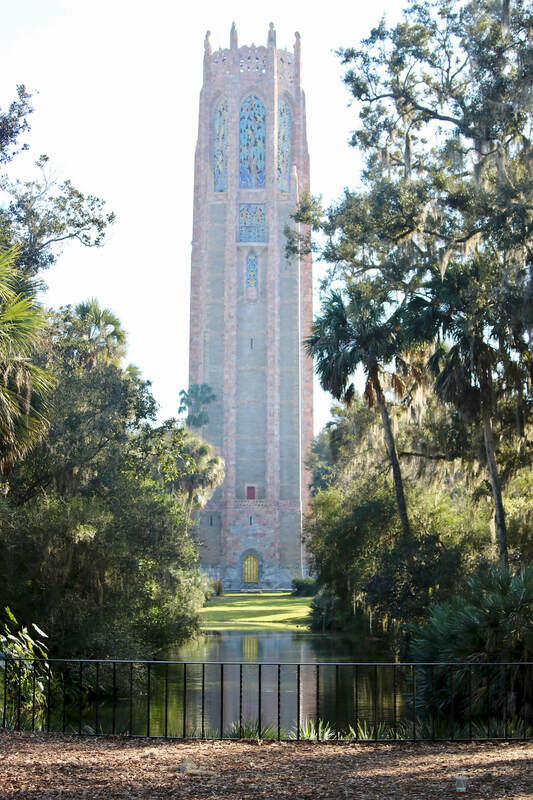 Located just two hours from Sarasota, Florida, Bok Tower Gardens transports visitors into a tranquil respite. 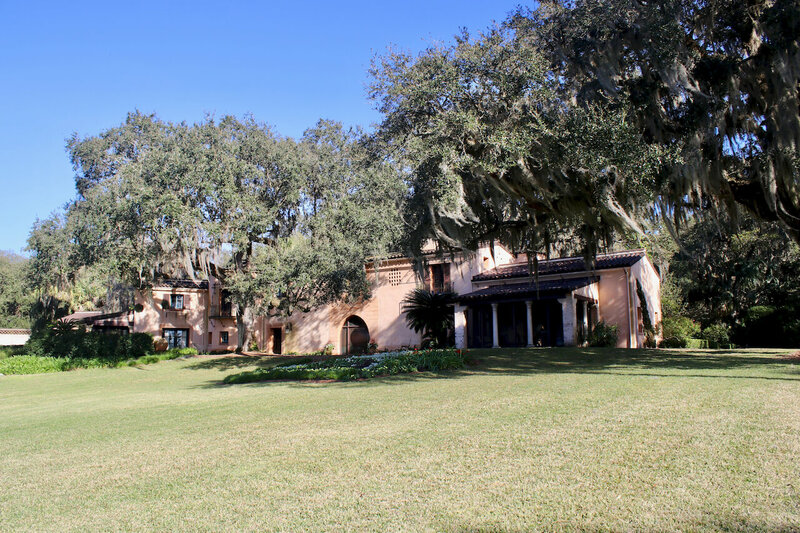 Guests can wander through 50 acres of meandering pathways and gardens, listen to the beautiful bells of the Singing Tower carillon, and stroll through an exquisite Mediterranean-style mansion. 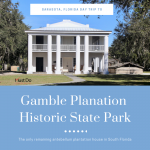 Open from 9 a.m. to 5 p.m., this national historic landmark located in Lake Wales is the perfect way to spend a gorgeous Florida day. 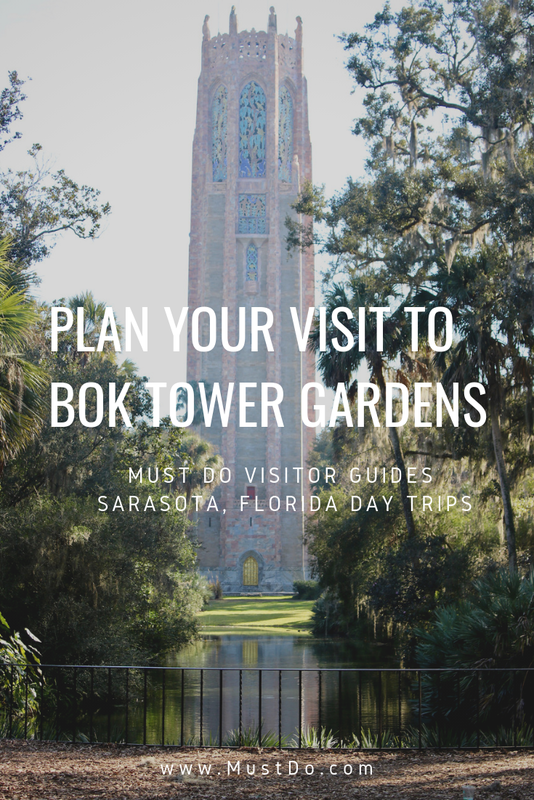 Read more about how to plan your visit to Bok Tower Gardens. 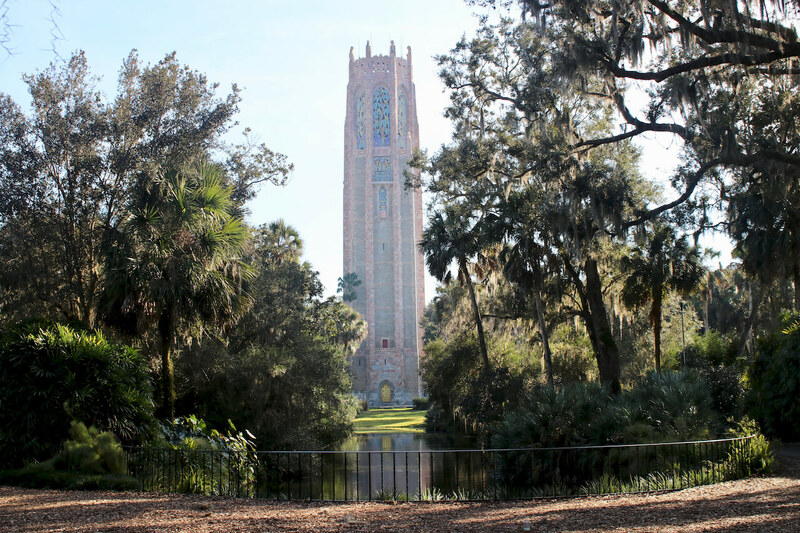 Bok Tower Gardens was created in the early 1920s by Dutch immigrant Edward W. Bok. He was transfixed by the beauty of one of Florida’s highest points, rising 295 feet above sea level in Lake Wales, Florida. 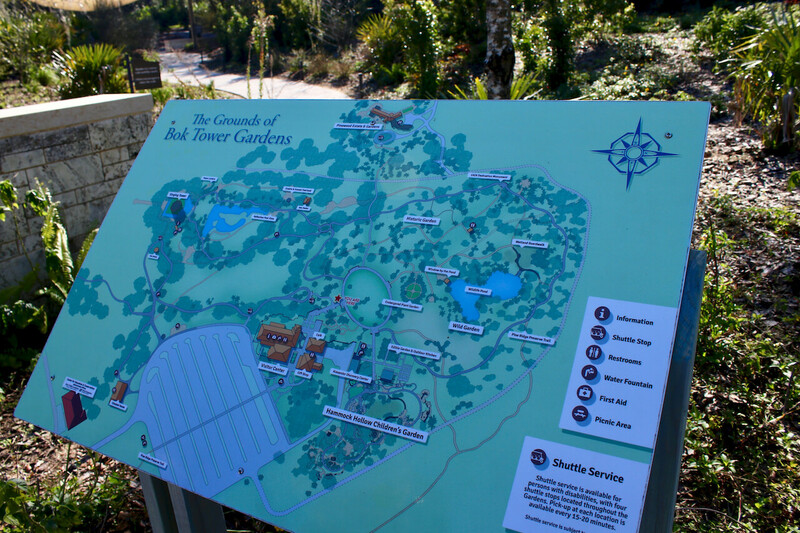 Bok purchased the land with the intention of creating a lush garden and bird sanctuary. He hired famed landscape architect, Frederick Law Olmstead Jr. to help him develop the arid scrubby landscape into “a spot of beauty second to none in the country.” In 1929 upon the gardens’ completion, Edward Bok gifted it to the American people. The gardens have now welcomed over 23 million visitors. 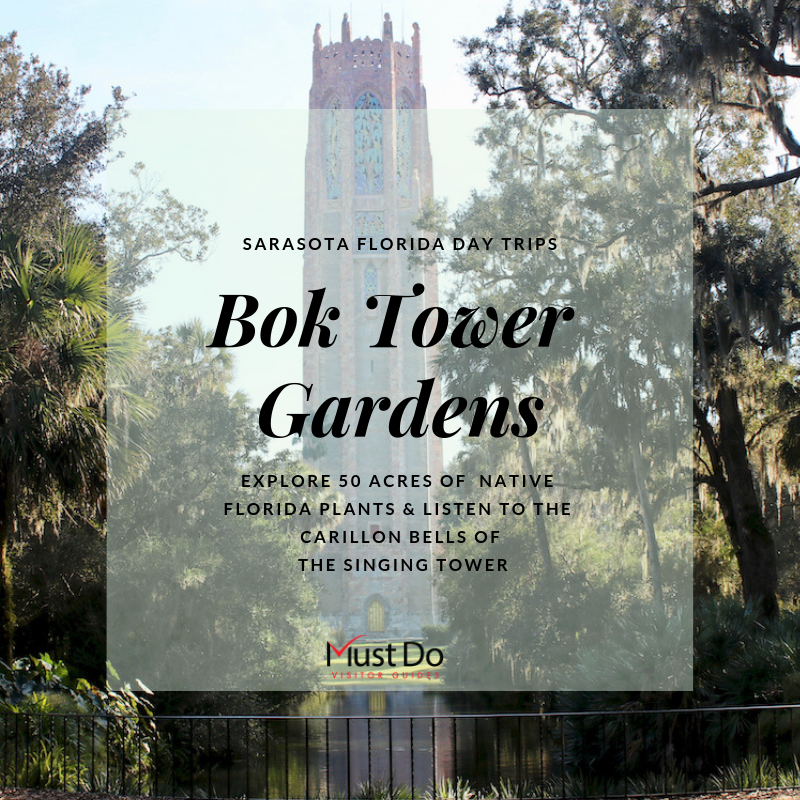 The best way to spend a day trip at Bok Tower Gardens from Sarasota, Florida starts by taking the back roads! Avoid the busy highways and instead idle along picturesque farm land under miles of blue skies on Florida’s state roads. 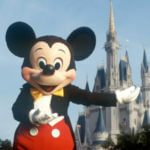 Bok Tower Gardens is a great destination for families, couples, or even small parties. 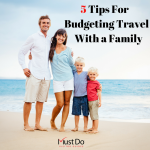 Pack a picnic to share, bring your favorite book, or your dog! Dog admission is $5 at the gate. Your furry friends are allowed on paths and lawns but not allowed in the Hammock Hollow Children’s Garden, Alexander Discovery Center, Pinewood Estate, The Shop at Bok, inside The Blue Palmetto Café, or in posted areas during special events. As you arrive in Lake Wales, Florida, take a quick detour to check out Spook Hill. Legend has it that a great war was waged here between an Indian Chief and a huge alligator, their final battle finding them both dead. Pioneer haulers later found their horses were nearly unable to climb up to the top of the ridge where the great battle was fought, they named the place Spook Hill. 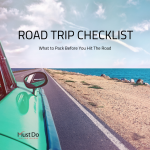 Drive your car up to the white line and place it in neutral, your car will roll back with considerable speed as if someone is pushing you away from the hill! 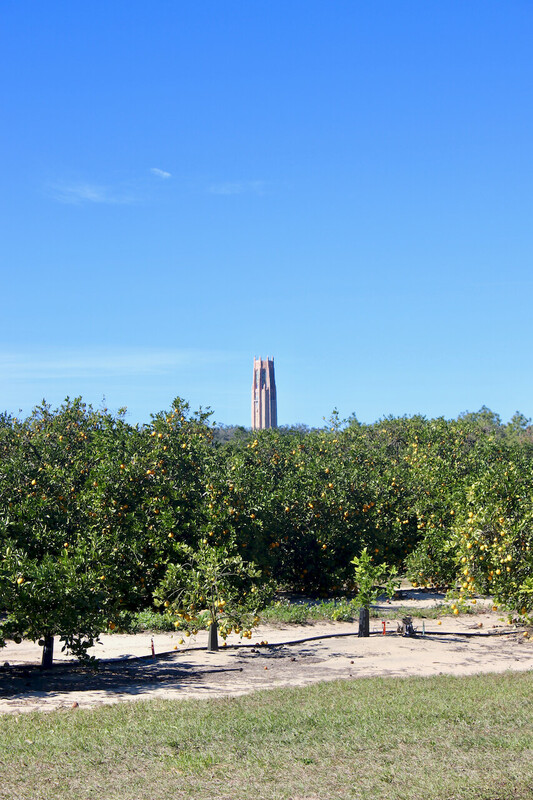 After you’ve had your fair share of ghost stories, continue down the road to the Bok Tower Gardens entrance and through rows of fragrant orange trees. 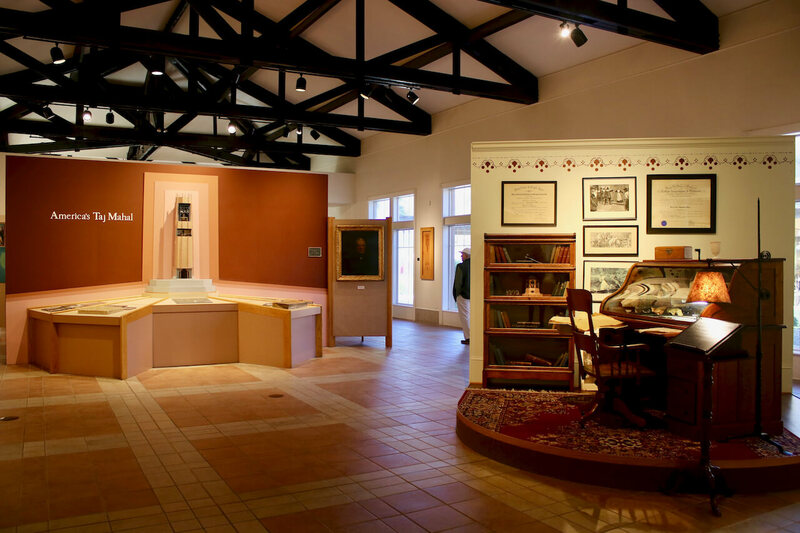 At the visitor center you’ll find an information desk where you can pick up a visitor guide and map, watch a 15-minute orientation film, and learn about the gardens’ history through rotating art exhibits and displays in the exhibit hall. 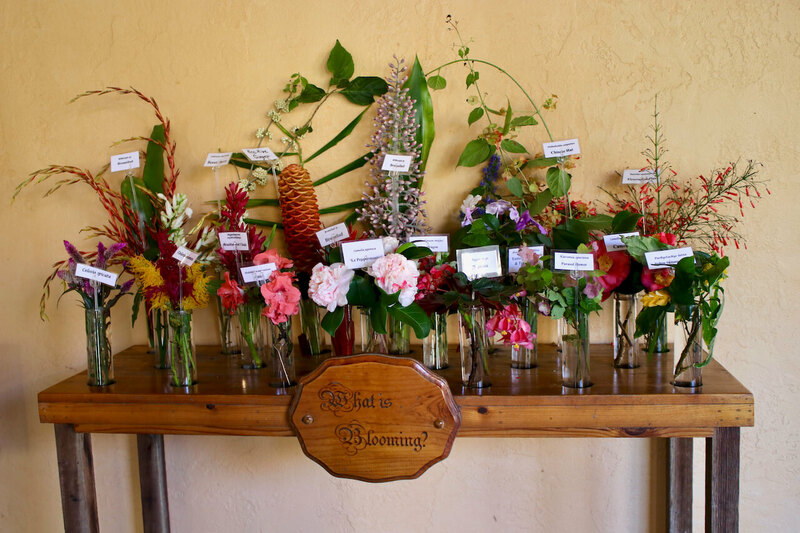 Upon exiting the visitor center, make a pit stop at the “What is Blooming” table for a sneak peek at the flowers currently blooming in the garden. If you are feeling peckish, grab a light lunch at The Blue Palmetto Café. The large menu features signature salads, soups, sandwiches, and wraps. There are also specialty desserts, local honey products, and beer and wine available for purchase. We particularly enjoyed a cold glass of Chardonnay with a tuna avocado wrap on their lovely outdoor patio. Bellies filled, it’s time to head out into the gardens! There are so many different habitats to explore throughout the natural woodland setting of the park. 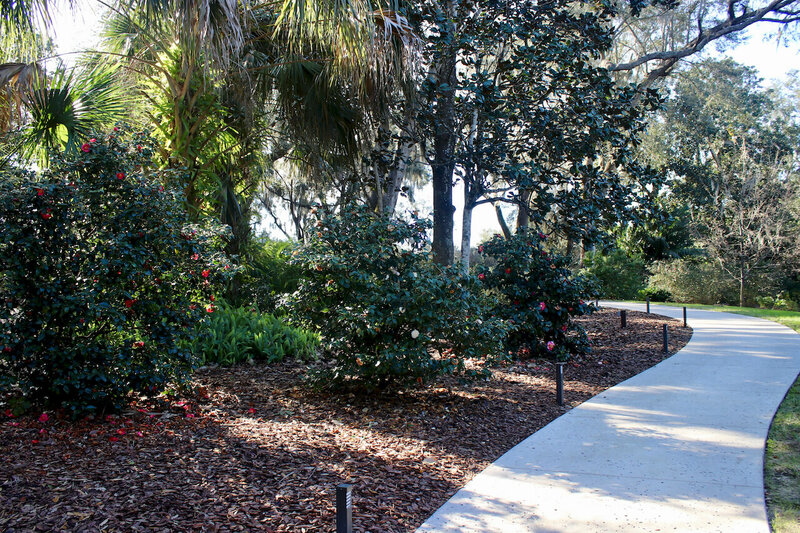 In the spring season visitors will be delighted by blooming azaleas, camellias, and magnolias throughout the pathways. 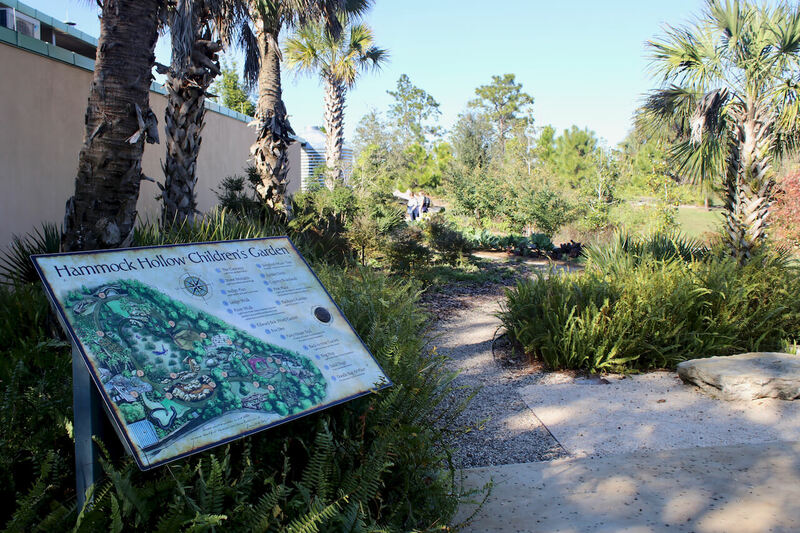 If you’ve come with little ones in tow (or even if you haven’t) make sure to check out the Hammock Hollow Children’s Garden. 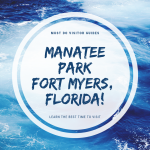 This specifically designed space is great fun for families with a splash filled river walk, a larger-than-life snake sculpture wrapped around a sand circle, a Fox Den log climb, Fairy House Trail, outdoor Chickee Hut, Spider Climb, and so much more! 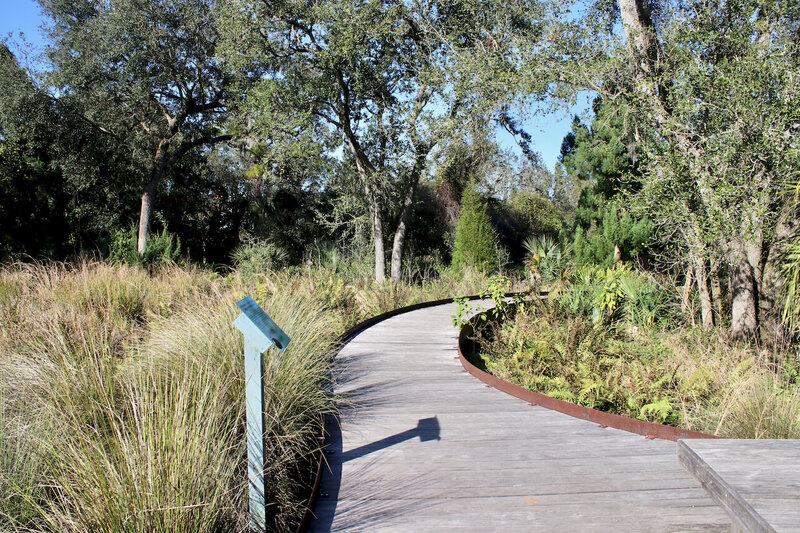 Make sure not to miss the Wild Garden where over 175 native Florida plant species were planted to showcase for unique local ecologies. Following the path, you’ll come along the Window by the Pond, where you can observe birds, reptiles, and butterflies which make this area their home. If you have brought along your dog or are interested in exploring the surrounds more, check out the 1.5 mile Preserve Trail which is dotted with interpretive signs explaining the role of fire in the Florida landscape, the history of the region, and the flora, fauna, and wildlife which make the area unique. Looking for a walk that’s a bit shorter? 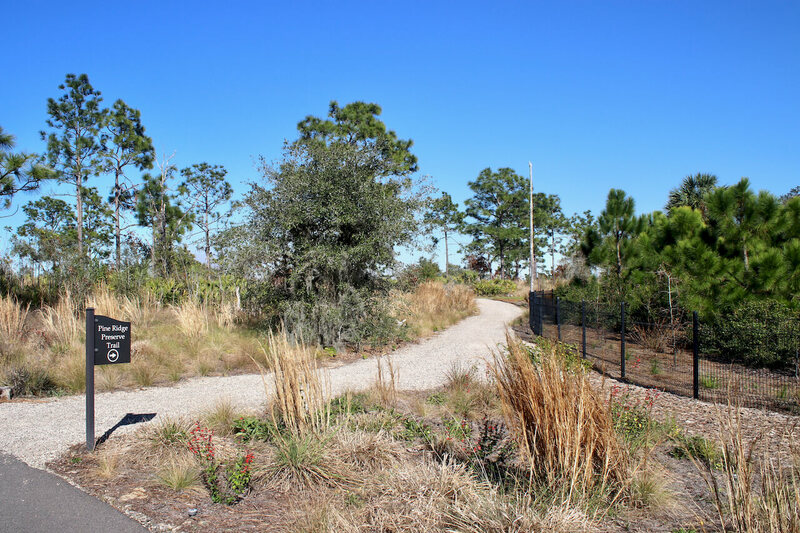 Stroll along the Pine Ridge Nature Tail (starting at Window by the Pond and ending at the Visitor’s Center) and learn about the longleaf pine forest. At about the midway point in the gardens you can visit the 1930s Mediterranean-style Pinewood Estate. This 20-room mansion was the former home of Charles Austin Buck and is well worth a walk through. Surrounded by seven acres of lush gardens, rolling lawns, and overlooking a beautiful pond, it is clear to see that Buck was a lover of nature as well. Tickets for Pinewood Estate can be purchased at the entrance gate or the visitor center. 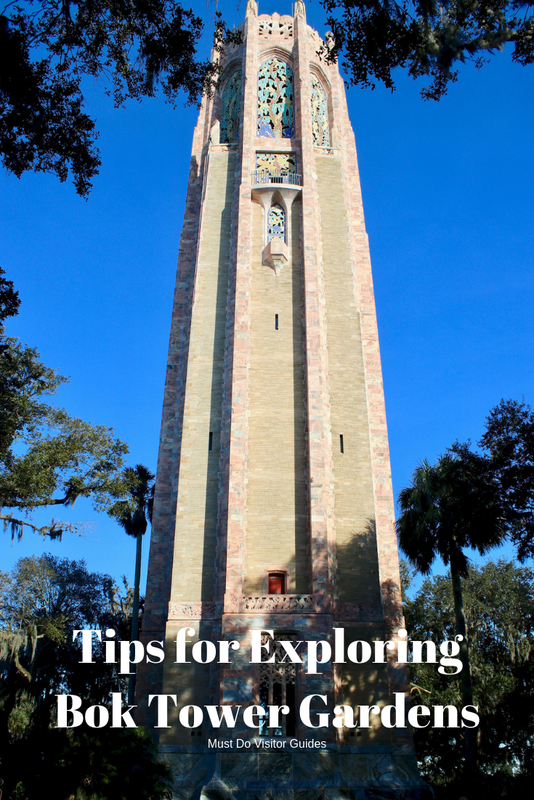 The crown jewel of Bok Tower Gardens is most certainly the Singing Tower and its Carillon shows. Standing at 205-feet tall, the tower was designed in the neo-Gothic and art deco styles by famed stone sculptor Lee Lawrie. Concerts can be heard at 1 and 3 p.m. daily and are not to be missed. 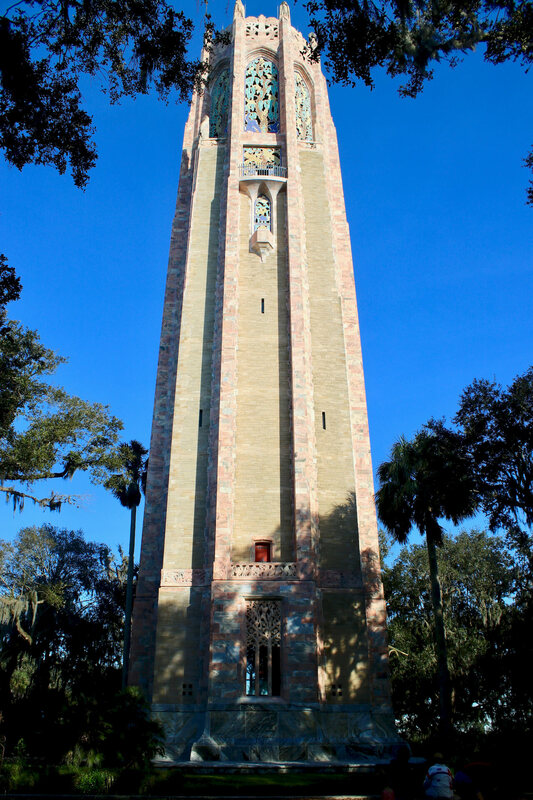 The carillon is one of four in the state of Florida and only 200 in North America! 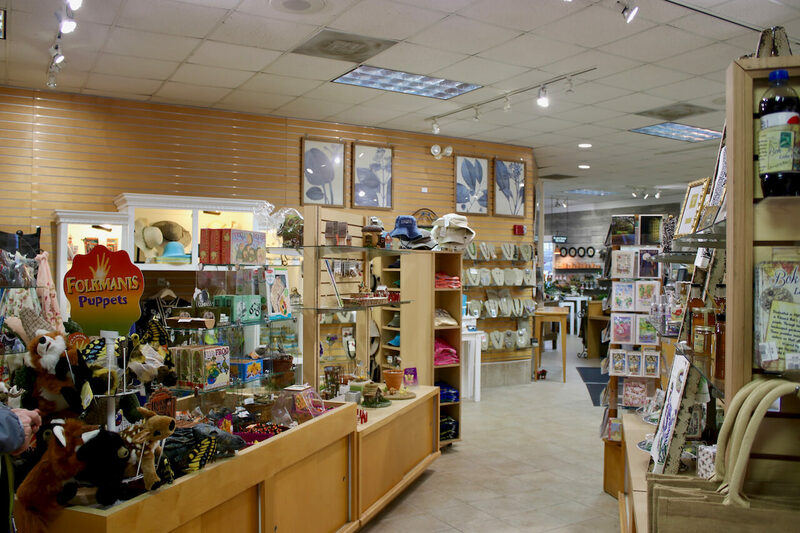 When you are ready to wrap up your visit, make sure to make a stop at the Tower & Garden Gift Shop located across from the visitor center. Filled with lovely smelling soaps, commemorative souvenirs, and gardening accessories and more, there is certainly something to delight! You can even take a bit of the garden to enjoy in your backyard or home by picking up a plant in the Plant Shop. If you liked this post, check out these other Must Do Sarasota day trips!